What: The Dead Sea, Dome of the Rock, Western Wall, West Bank security wall, The Church of the Nativity, Oldest city in the world, Manger Square, Temptation Mountain, Israeli/Palestinian checkpoints, Jesus' birth stone. How: International flights, Hostel transfer, Walking, Taxi, Cable Car, Marashutka. Illnesses or mishaps: Witnessing a rather ugly argument about religion at the Western Wall; nasty sunburn causing me to wrap a scarf around my head; finding the level of security and military presence a little too intense. Taking advantage of reasonably-priced air fares and an impending holiday, we decided to maximise the potential of Israel by splitting it into a two-step holiday starting in Tel Aviv and heading south eastward to the world famous Jerusalem - the epicentre and point of intersection for several world religions. That was the plan but, as you'll see in this Chronicle, our trip to this culturally rich and explosive slice of the Middle East quickly spiralled into an unforgettable adventure. The Palestinian Territories are comprised of two geographically disconnected scraps of land: Gaza and The West Bank. It is the latter we visited, thanks to the assistance of an Arab Israeli driver called Jason. For a total of £175 he took us directly into the West Bank to see in person the holy sights of Bethlehem, to float in the Dead Sea with its supposed magical properties, and to experience the ancient city of Jericho, said by some to be the oldest city on earth. It was money we'd never intended to spend and had he not approached us in the hotel lobby in Jerusalem, we wouldn't have gone to any of these incredible and captivating places. Jason's religious and Arabic ties gave him direct access to the West Bank, whilst his Israeli citizenship meant that he could travel freely in the country. His local know-how got us through both Israeli and Palestinian checkpoints with relative ease; he knew the things we were to say (and, more importantly, not to say) to the intimidating Palestinian and Israeli border guards clutching their machine guns, some of whom took to peering through the taxi window at us as if trying to read the truth of the driver's yarn in our faces. I am not a great liar and thanked my lucky stars they never took to questioning me. The sad truth is that without the serendipitous encounter with Jason, there would have been no West Bank dimension to the trip which, in my opinion, was its undisputed highlight (if for no other reason than the words 'West Bank', so frequently referenced in news bulletins, sounded edgy, dangerous - and exciting). In meeting him our visit to the two countries was transformed from a mere trip in to an adventure I will never forget and one which I recall here with much fondness. Israel is a tiny country which punches way above its weight on the world stage. Where Israel's concerned, small certainly does not mean insignificant. For such a little country Israel rests worryingly on the international consciousness; a place of religious tension, division and violence which regularly hits the international headlines. Diametrically opposed and deeply held beliefs have to share a very compact geographical space here, competing to win the argument and, in doing so, the right to rule over this small but pivotal slice of the Middle East. Israel's predicament is that it is at the centre of a much broader proxy battle between two huge religio-political blocks; it rests uneasily at the tense intersection between the West and the Arab Middle East. Indeed, rumours abound in online travel forums that having an Israeli stamp in your passport has the potential to impede your entry at airports in some Arab and Muslim countries. Luckily the Morocco stamp in my passport did not cause me any real issues but they did check all of my stamps. And very carefully. Israel is rather isolated on a peninsular dominated by the Arabs, and teeters on the very northern edge of the Arabian Peninsula (or 'al Jazeera' in Arabic). This goes a long way to explaining the way Israel is and how, as a foreign visitor, you will inevitably see and experience the country: security, security and more security. Rather than reassuring me, the level of security left me feeling paranoid and exasperated. At some point any visitor will experience a feeling of frustration, too; frustration at having to empty your bag for the umpteenth time in a single day, at relaxing with a coffee on a beach and beholding scores of machine gun-wielding soldiers marching past in khaki, at the abrupt way you will be spoken to by anyone involved in the country's security. This is security without smiles. As a result Israel, in some areas, feels unfriendly and unwelcoming. These people are serious. Deadly serious. When approached by any security-related personnel my advice to you is to smile, remain polite and, crucially, have your 'backstory' sorted with anyone else you are travelling with. This seems a little silly, as you are not lying, but any hesitation or slightly differing answers to abrupt questioning at the airport could raise unwarranted suspicion. For instance, do you consider yourselves university friends? How did you meet? Where did you meet, exactly? How long have you known each other? These intrusive questions, especially in your immediate post-flight docility, have real potential to wrong-foot you and therefore elicit "erms" and "uums" rather than clear, confident responses. Cue having your bags searched, cue further questioning ...or worse. Indeed, a friend's experience at Ben Gurion Airport is a case in point: detained for twelve hours in the basement, interrogated, parents in the UK contacted, bank account checked, reduced to a quivering mess. It was an horrific experience for her. Proceed with caution. Israel is as complex a country as it is small. It is an interesting assortment of very different centres: Tel Aviv, Jaffa and Jerusalem. All of these places have their own unique character and could, rather convincingly, each exist in different parts of the world, let alone the same country. Tel Aviv had all the glitz and glamour of a cosmopolitan city but with an incongruous lingering threat of an unsavoury security incident hovering just below the surface. Jerusalem felt like a tinder box waiting to ignite - the meteorological heat of the day serving only to ratchet up the metaphorical temperature of the place. The Muslim port city of Jaffa was a little oasis of calm amid a sea of tension. Israel is not a place I could relax. Of course, as this site attests, my trips abroad are not about relaxing and ensconcing myself far away in a sanitised, artificial retreat in the hills somewhere, or sunbathing moronically on the beach with a good book. I travel to see. I travel to witness. I travel to capture. I travel to learn. Thus, if your travel preferences are something similar to my own, Israel and, by extension, the Palestinian West Bank, are places you must visit. Tel Aviv has long had a dangerous and exotic quality for me ever since the Gulf War of the early 1990s. Tel Aviv, frequently a target of Iraq's scud missile attacks, would often feature heavily on news bulletins in the UK, mostly characterised by terrified reporters transmitting live from an apartment balcony wearing gas masks, with air-raid sirens wailing. To say that this did not play a part in my decision to travel here would be disingenuous. It is because of these haunting images seen when I was a boy that I felt drawn to visit the city and experience it for myself. We arrived at sunset and, by the time we had disembarked from the plane, Tel Aviv was enveloped in darkness. The first evening was thus a write-off, even more so because it was Monday and most outlets seemed to be closed. On first impressions, and in the dark, Tel Aviv looked like an Israeli version of the Costa Del Sol. I was worried. The next morning began much more promisingly after a chance encounter with a copy of 'Time Out Israel'. In what seemed like the fastest lift on earth, we took a trip to the top of the Azrieli Tower, affording us stunning views out across the city. It was a dramatic and powerful vista, the elegant white shapes of the towers set against the velvety blue of the Mediterranean. Although I'd checked weather details before departing for Tel Aviv, the heat really took me by surprise, resorting to a hasty and expensive purchase of sun care products, soon followed by an obligatory hat purchase later once we'd made it to Jerusalem. Whilst in the coastal city, we also took in several Bauhaus buildings, the Bauhaus exhibition, a walk along the beach to Jaffa, and a rather wonderful pink sunset view on the final evening. No trip to Tel Aviv is complete without a significant serving of security. The fact is that day to day life and security fuse in Israel's glistening, modern metropolis. It's a contradictory place where a milky latte is forced to share the same space as a machine gun, where high-class shopping boutiques exist uncomfortably alongside military helicopters zooming overhead. It is this incongruity which is Tel Aviv's innate, confusing contradiction. There are reminders everywhere of the vulnerability of the city and of its inhabitants: an afternoon saunter into a shopping centre is preceded by an airport-style scanner search of both bag and body - hardly the way to make you feel in the mood to splash the cash. The serious and the frivolous jostle for supremacy in Tel Aviv and it is an unappetising combination of ingredients for the novice traveller to reconcile. For the serious traveller, however, it adds a socio-political dimension to their visit to Israel - underscoring the fact that the country is resented and disliked by many of its closest neighbours. A journey to Tel Aviv is, therefore, an opportunity to learn about, and taste, the struggle of a people, to hear the echoes of horrific historical events and to glimpse this country's promising future. The rather impressive view of Tel Aviv's cityscape as seen from the top of the Azrieli Observatory. Bauhaus architecture : A key trait of the style is rounded curves. Stunning sunset along the promenade with silhouetted watchtower. In many ways, Jaffa is Tel Aviv's opposite. I have given Jaffa its own section as it is worlds apart from its younger upstart a mere two kilometres further up the coast. I liked the grittiness of Jaffa, I loved its hustle and bustle, its grime, its noise and car horns, and its humble single storied ruinous buildings. Evocative views greet you at the top of St Peter's Monastery. Tel Aviv gets all of the glory and attention, whilst Jaffa sits quietly waiting for you to visit with its offering of laid-back flea markets and cobbled squares. A mosque minaret on Jaffa Hill looks out to harbour with the apartment blocks of Tel Aviv in the distance. Lighting hangs for sale in Jaffa's flea market along Oley Tzion Street in Jaffa. Notice the trilingual sign in Hebrew, Arabic and English. I am a far better traveller now than what I was when I visited Jerusalem. I didn't know what to expect and, admittedly, I was still a little green when I first stepped foot in what is without doubt the most holiest of cities. Jerusalem has an intensity that I have experienced in very few places. It's a frantic, gritty and intoxicating place where pilgrims and believers from many of the world's religions converge to show their devotion amid an atmosphere of extraordinary security and unrelenting tension. The views of Jerusalem's iconic Dome of the Rock, glittering in the burning sun, was a true sight to behold. It is the kind of building which makes you feel alive; one which makes you feel like you are not just a passive onlooker superficially ticking off a list of 'must see' landmarks, but are part of something far more significant - whatever that may be. If Jerusalem is the body of world religions, then The Dome of the Rock and Temple Mount are its beating heart. At the Western Wall never before have I seen such devotion fused with the promise of uncompromising violence; military personnel tenderly kissing the Wall whilst cradling their black, shiny machine guns. Indeed, during our visit to the Western Wall Plaza, an argument erupted between a small group of Ultra Orthodox Jews and what I took to be an Australian tourist (from the accent). Their heated debate about scripture and theology teetered on the brink of flaring into violence, with one threatening, "Come here again and there will be trouble." And he meant it. With so many machine guns about, the sun beating down upon me and arguments about which I knew nothing breaking out sporadically all around, it felt like the right time to beat a hasty retreat and head for the relative safety of a nearby restaurant - named, perhaps reassuringly, the "All Nations Cafe". For any traveller whose mission is to travel in order to learn and understand, I suggest that there is no other place in the world quite like Jerusalem. It's an evocative, powerful, inspiring and difficult place to be - which, of course, are the most compelling reasons to go. Iconic Jerusalem: the alluring golden of The Dome of the Rock and its evocative blue tiling. The colourful facade of the Church of All Nations. Despite my initial impression of the Palestinian Territories being influenced by the hard-nosed, khaki-clad military personnel peering into our vehicle at the checkpoint thoroughly verifying our passports, Palestine felt remarkably different once we were away from the politics of the border itself. We had effectively crossed an international border by going through such a checkpoint; we were now on land controlled by the 'Palestinian National Authority', and had unofficially left Israel. We weren't to know it at the time but having visited the Palestinian-controlled West Bank had the real potential to cause problems with the authorities back at Ben Gurion Airport. We were advised to keep our visit to this controversial slab of land a secret from the authorities to avoid the possibility of unnecessary questioning. The West Bank was a warm-hearted place with a palpable respect for guests who had clearly taken the time to visit their troubled country. Indeed, our guide who took us into Bethlehem was my first introduction to Palestinian people and proved to be just like all others who followed him; respectful, dignified, calm and always commencing conversation with the stock greeting, "You are welcome". It is a greeting I would come to experience in my subsequent travels across the Arab world in places as diverse as Jordan, Oman and Kuwait, to name but three. 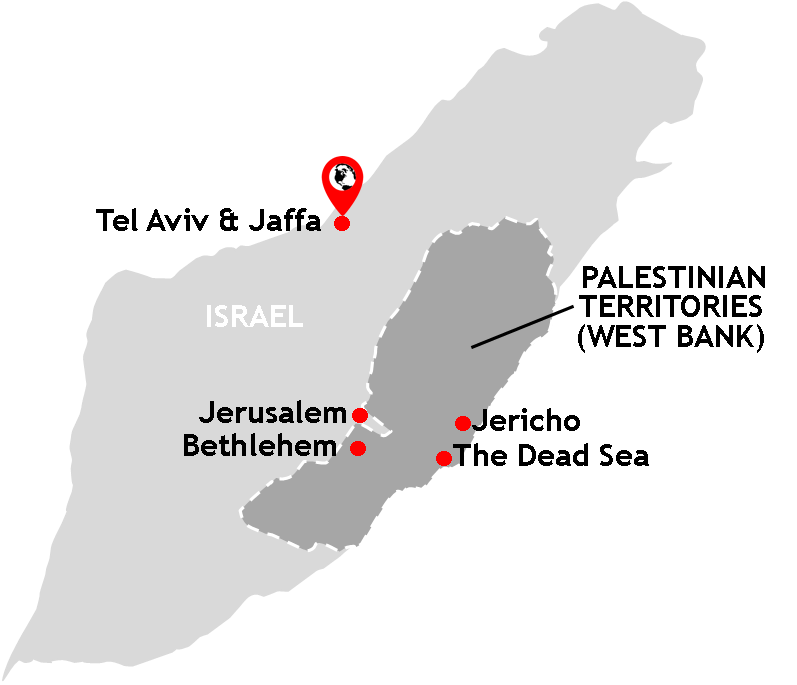 The West Bank is so-called because it resides on the left bank of the River Jordan. On entering Palestinian-controlled territory we passed road signs for "Gaza", "Hebron" and "Ramallah", place names so frequently associated with infamy and ignominy in Western news bulletins. "This really feels like adventure travel. I'm a real traveller now", I stupidly thought to myself. I took a gulp and decided it would be circumspect to text message a couple of friends as to my whereabouts and who I was travelling with. Who was this Jason, anyway? Could we trust him? How ridiculous it was to jump into the car of a complete unknown and head into a 'country' unrecognised by much of the international community. Such menacing thoughts toyed with my mind as we drove toward our first stop in the Territories - a place I had heard about ever since I could remember: Bethlehem. Yes, I was in Bethlehem. Just being in the place I had heard about ever since I could remember was a truly visceral experience; it was the place I thought for many years was perhaps even mythical and legendary. The place I had read about in Religious Education and the place mentioned in so many of the Christmas carols I had sung as a schoolchild while waiting eagerly for Christmas Day and the opening of presents to finally arrive: donkeys, away in a manger, Mary and Joseph, no room at the inn, Bethlehem. It did exist and I was standing in the famous Manger Square at its heart. We disembarked and were quickly handed over to a contact of our driver who took us, by foot, on our whistle-stop tour of this most famous and holy of places. We were lead through Manger Square, stopping only to be shown a map on public display which graphically detailed the shrinking size of Palestinian land across the decades, land slowly appropriated by Israel since its creation in 1948. We entered the Church of the Nativity and, like many a pilgrim, were shown the spot where it is believed Jesus was born. Touching the stone, its edges encased in silver, is a right of passage for many Christians. I only took to touching it because our guide was of the opinion that I should. As an atheist it all felt a little silly but, out of respect for my guide and other visitors to this holy site, I played along and pretended to have a spiritual moment. Our experience of Bethlehem concluded with a visit to the large, looming grey bulk of the West Bank Wall which separates the Palestinian-controlled West bank from Israel and which seemed to symbolise the intractable nature of the complex issues in this part of the world. Standing under the soaring, interlocking concrete panels topped with barbed wire and daubed with graffiti demanding freedom for Palestine, I felt as far away from Mangers, donkeys and Jesus as it was possible to get. Striking graffiti on the West Bank security wall. At the foot of the wall on the Palestinian side. Inside the Church of the Nativity: the opening to the area where the stone upon which Jesus was 'born' is a right of pilgrimage for Christians world-wide. Having headed back to Jerusalem from Bethlehem the previous day, and having decided that Jason was kosher and unlikely to be a militant who would take us out into the desert and do unspeakable things to us unless a ransom was paid, we made an arrangement to head back into the Territories with him for a second time: more checkpoints, more machine guns and more palpable tension. We passed Bedouin settlements in the desert to arrive at what is the world's lowest sea level point at minus 420 metres. A visit to the Dead Sea at Kalya is simultaneously a visit to an Israeli settlement inside the Palestinian Territories and is considered illegal in international law. The Dead Sea is the lowest sea-level point in the world. Playing with the famous mud of the Dead Sea which later played havoc with my sunburned face. Jericho is a rather delightful place where camels cross the road and where donkeys try to escape the fierce sunshine in the shade of giant cacti. It is a calm and tranquil city in which to contemplate what really matters in life. It also holds the accolade of being the oldest city in the world, said to be around 10,000 years old - the historical remnants of which we could see for ourselves if we paid the 'Palestinian Authorities Department of Antiquities' a few Shekels. The site included the world's first ever tower and its first ever staircase. Jericho is also known for being the place where the sycamore fig Tree of Zachaeus, an ancient specimen mentioned in the Gospel of Luke and which, if you are a believer, you can see growing contentedly by the roadside. I am no arborist but, I can confidently assert, the tree does indeed look to be from another world altogether. With time running out we made for the cable cars at the foot of the ancient ruins and up to the evocatively-named Temptation Mountain. There was an issue with trying to pay using my credit card at the small tourist centre, prompting the kind Palestinian lady to pull on a few favours with neighbouring vendors to complete the transaction. For her trouble I also purchased a small mosaic drum covered in goat skin and which now takes pride of place on my bookshelf at home. It was my way of saying thank you to the Palestinian people who had treated us so warmly and with so much respect during our short time there. In Jericho, people welcome the visitor with a humbling sincerity which I found utterly touching. Desert views of the Jericho mountains and houses as seen from on-board the cable car on the way back down from Temptation Mountain. Nabu Musa mosque on the outskirts of Jericho. A message of peace in two languages. A camel calmly holds up traffic in Jericho. For obvious reasons this photograph is blurred as I struggled to capture the lolloping camel through the car window. Obviously, be careful where you point your camera, particularly in areas where security concerns are heightened or where their is a significant presence of military infrastructure. Be mindful of wearing shorts, too, as these are seen as too informal for some religious sites. If you're planning on visiting religious buildings, it's advisable to pack trousers and a long-sleeved shirt in your day bag ready for immediate donning. It's probably advisable that you remove any evidence of having visited The Palestinian Territories on re-entry to Israel (carrier bags with addresses on for example). This will ensure you get far less hassle from border soldiers if they check. Try to buy a few souvenirs in The Palestinian Territories to support the local economy; Israel tries to restrict the flow of tourists into the Territories and the financial benefit of your visit is much needed and will be very much appreciated by locals - regardless of your views. Check your passport stamps. Rumours abound that certain stamps representing visits to certain countries could impede your entry into other countries. Do your research before you depart. When travelling in Israel, particularly in places where a significant number of people gather, it is worth keeping your eyes peeled. Suicide attacks can and do occur. Indeed, two months after our visit, a bomb was detonated in a central bus station in Jerusalem. News footage broadcast in the UK revealed it to be the station we had used ourselves.